The stone building was located on what was originally called Van Staphorst Avenue by Joseph Ellicott when he laid out the city in the early 19th century. Originally the site of the Ebenezer Day house, whose occupation was mason and whom Samuel Welch in his "Recollections" credits with laying out most of the substantial brick sidewalks of Buffalo in the 1930s. By 1889 the Day house was replaced by a large hotel, the Manhattan, and Police Station No. 3, which was located directly behind the hotel. The hotel was replaced by the present structure, built by Thomas Dickinson to house his jewelry business. Thomas Dickinson came to this country with his parents in 1836 from Leicester, England. After working for a brief space as a journeyman, he opened a store of his own at 370 main Street in 1849. The firm later relocated to 254 Main Street in 1865 with Mrs. Elizabeth Dickinson becoming a partner the following year. On September 17, 1919, the Dickinsons filed plans for a new building at 618-620 Main Street, at an estimated cost of $88,000. The store remained at this location until 1949 when they relocated to Delaware Avenue. The T. and E. Dickinson Jewelry Store was Buffalo's leading jewelry establishment. It contained one of the most extensive jewelry inventories in the country. The firm remained in business until 1965. The building was bought in 1949 by Martin Jacobi who had started a men's clothing store in 1930 at 599 main Street. The business remained in operation until 1982. The building was subsequently sold to Buffalo Savings Bank and later to Levy, King and White (now defunct), an advertising company, who in 1984 restored the facade and renovated the interior. In the early 1900s Eric Mower and Assoc. occupied the building. In 1991, the Buffalo Enterprise Development Corporation foreclosed on the building, later moving its offices to the building. The building became home to Reciprocal Inc., an e-commerce company that moved out in early 2001. 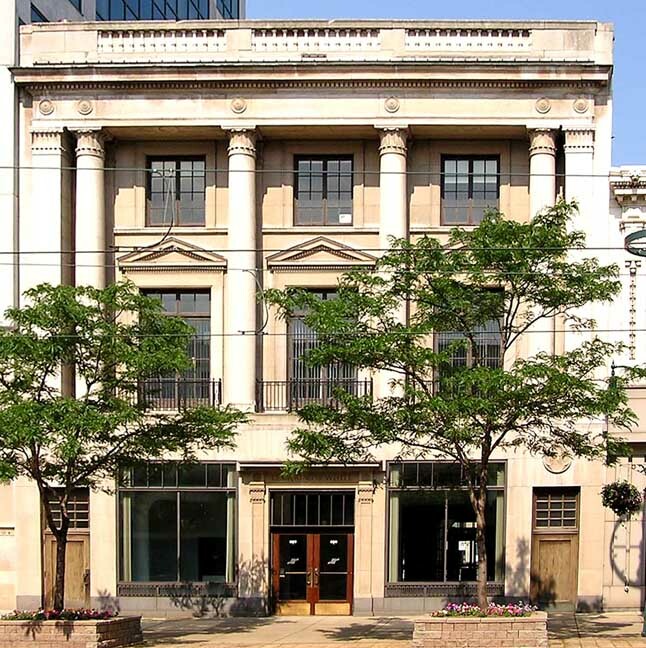 According to a newspaper article in January of 2003, the building was to be purchased in February by 598 Main St., LLC, an investment group. Has been characterized by architectural experts as one of the most refined Neoclassical designs in the Theater District. "Chippewa Street Development Report," Roger Patterson, 1980.